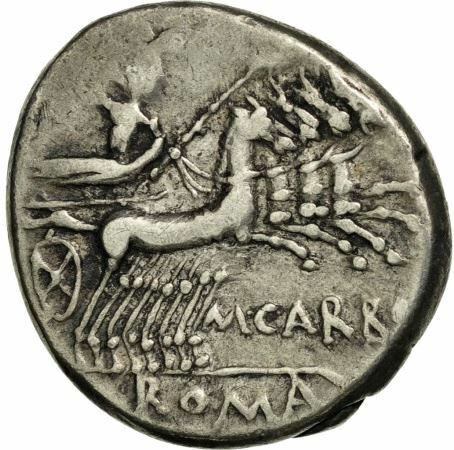 M. Papirius Carbo was one of the moneyers for the year 122 BC. He may have served as Praetor in SIcily. Gens Papiria was an ancient patrician family at Rome. According to tradition, the Papirii had already achieved prominence in the time of the kings, and the first Rex Sacrorum was a member of this gens. Lucius Papirius Mugillanus was the first of the Papirii to obtain the consulship in 444 BC. The patrician members of the family regularly occupied the highest offices of the Roman state down to the time of the Punic Wars. Most of the Papirii who held office under the later Republic belonged to various plebeian branches of the family. Among the plebeian branches of the Papiria gens, the most important was that surnamed Carbo, referring to a piece of coal or charcoal; metaphorically, something black, or of little value. The Papirii Carbones appear in the first half of the second century BC, and continued down to the time of Cicero.